The next upcomings President's Day is celebrated/ observed on Monday February 17th, 2020. 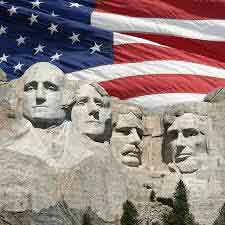 President's Day, also known as Washington's Birthday, is on the third Monday of February. It not only honors George Washington, the first President of the United States, and Abraham Lincoln whose both birthdays are in February, but honors all the presidents. It is a federal holiday although most businesses are open except the Post Office. President's Day officially honors George Washington's life and his contribution to the United States as the first President. Some states will also honor Abraham Lincoln on this day since his birthday is mid-February. George Washington's birthday is February 22. Other states honor all past presidents of the United States. Many schools and organizations will have events and lessons about the presidents particularly George Washington. In 1879, it was originally implemented by an Act of Congress for Washington government offices as a federal holiday. It expanded to include all federal offices in 1885. It was first celebrated on Washington's birthday, February 22. Then in 1971 it changed to the third Monday of February. The first attempt to change the holiday to President's Day came in 1951 when the "President's Day National Committee" was formed. The purpose was to honor the office of the Presidency, not a particular President. It was not until the mid-1980's did the "President's Day" term appear in public.